"The quality of student learning is directly, although not exclusively, related to the quality of teaching. Therefore, one of the most promising ways to improve learning is to improve teaching" (Angelo and Cross). Assessment reveals what students have learned; instruction supports learning. Two considerations prior to the assessment of information literacy, for example, are learning outcomes and curriculum mapping. Clearly defining student learning outcomes within the context of a curriculum provides shape and direction for assessment leading to meaningful, transformative results. To select appropriate verbs, consider using verbs based on Bloom's Taxonomy. This "learning model [focuses on] the notion that learning presumes to occur in this linear and hierarchical fashion. That is, relatively simplistic learning ...must necessarily occur before learners can engage in more sophisticated and creative learning" (Netl). A chart listing many ideas for verbs, using Bloom's Taxonomy, is available here: http://libguides.palni.edu/ld.php?content_id=36018340. Below are learning outcomes written by Goshen College for a first year class orientation session. Learning outcomes written for the entire student body are much larger documents and generally involve a structure such as a table. Below are several examples. Pearson Library. "Information Literacy Student Learning Outcomes: Tier 1 First-Year." California Lutheran University, http://public.callutheran.edu/~mondsche/IL/IL_SLOs_Tier1_0708.pdf. Pearson Library. "Information Literacy Student Learning Outcomes: Tier 2 Sophomore and Junior Year." California Lutheran University, http://public.callutheran.edu/~mondsche/IL/IL_SLOs_Tier2_0708.pdf. Pearson Library. "Information Literacy Student Learning Outcomes: Tier 3 Senior/Capstone Year." California Lutheran University, http://public.callutheran.edu/~mondsche/IL/IL_SLOs_Tier3_0708.pdf. Tomlinson Library. "Library Instruction Student Learning Outcomes." Colorado Mesa University, http://www.coloradomesa.edu/library/faculty/information-literacy.html. Ylvisaker Library. "First-Year Learning Outcomes." Concordia College, https://cordlibraryinstruction.weebly.com/uploads/2/6/0/1/26010585/first-year_information_literacy_dispositions_and_knowledge_practices_2018.pdf. Ylvisaker Library. "Intermediate & Advanced Learning Outcomes." Concordia College, https://cordlibraryinstruction.weebly.com/uploads/2/6/0/1/26010585/milestones_and_advanced_information_literacy_dispositions_and_knowledge_practices_2018.pdf. "Bullard and Holden...outlined the following steps for curriculum mapping a discipline: review the degree requirements for your course of study; analyze individual courses and identify existing information literacy concepts and areas of weakness; create a draft of a curriculum map showing areas of existing and potential information literacy; request a meeting with faculty with whom you have good relations to share your results and get their feedback; and then begin marketing your ideas ot the rest of the department" (as cited in Archambault). One very unique and interactive curriculum map was created by Claremont Colleges using Mindomo software. 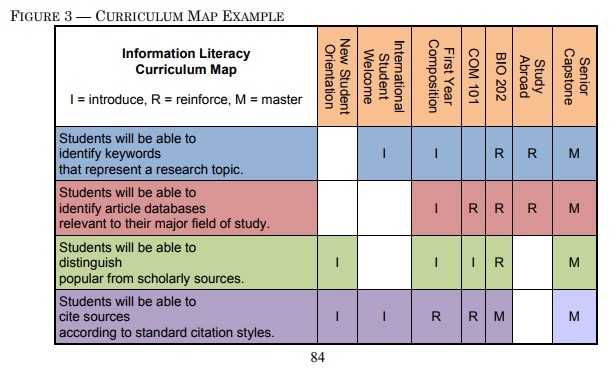 Most other curriculum maps are done in a table format. The content outlined on this tab details information that should be in place prior to assessing your institution and/or information literacy program. Assessments should align with learning outcomes (class and/or program) and instructional strategies (Carnegie Mellon University). Assessment "requires attention to outcomes but also and equally to the experiences [instructional design] that lead to these outcomes" (Brown University). Curriculum mapping "presents a visual representation of the library's information literacy instructional outreach which can be used to evaluate relationships between current practices, the academic curriculum and intended learning outcomes" (Buchanan). Student awareness, rubrics, and past student work is beneficial. Make students aware of the assessment tool(s) prior to instruction but after they have been made aware of the learning outcomes (McTighe and O'Connor). ​​Present evaluative criteria, such as a rubric, and models of past student work of varying qualities prior to and during the instructional process (McTighe and O'Connor). Assessment "works best when it is ongoing not episodic" (Brown University). One-shot assessment is better than no assessment. However, tracking the learning of individual students or a cohort of students is most transformative. Pre-assess for a baseline (McTighe and O'Connor). Provide feedback "early and often" (McTighe and O'Connor; Bowles-Terry and Kvenild). Emails to faculty and/or students, instructional videos, LibGuides, and follow-up library sessions are examples of feedback. In addition to providing feedback and following up with students and faculty, disseminate the results to those responsible for making change by closing the loop.